Over the weekend, my husband and I hosted a party where the theme was all things tiny and HUGE, so the menu included food and drinks that were either especially small or large. 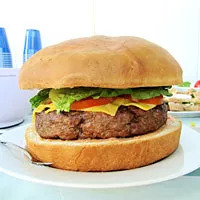 We served two giant hamburgers (one was a bacon cheeseburger). Each of which served more than a dozen people. 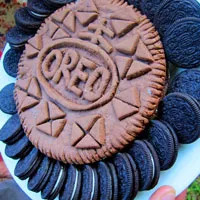 We also made a massive Oreo cookie! On the tiny side of things, we served bite-size club sandwiches, sliders, tiny homemade pizzas, and mini chocolate peanut butter cupcakes. It was quite an event! I could have easily overdone it with all of those tiny and HUGE foods, but I made small changes to my eating that added up big time! No, not champagne! Instead of diving into the party atmosphere with a high-calorie cocktail, I started with a glass of no-calorie seltzer water. The bubbles from the carbonation gave my stomach a full feeling before I was faced with a spread of delicious eats, which helped me slow down and think about my food choices. Our menu for the party included lots of fun foods, but not very figure-friendly ones. Thankfully, a couple of friends brought healthy appetizers (BLT bites and veggie skewers), so I ate a bunch of them before splurging on the high-calorie foods. When faced with a table full of delicious foods, I grabbed a small napkin to serve myself since it provided me with a visual aid of how much I was eating. It’s easy for me to lose track of small bites here and there and I could have easily munched all party long, so the napkin system really works for me. Plus, I can always go back for a refill if I am still hungry. At festive summer parties calories can really add up, so I cut where I could. For instance, I really love bacon cheeseburgers, but an easy way to reduce calories is by nixing the bacon and cheese from my burger. These two ingredients can add a lot of calories and fat. Instead of missing out on the fun of eating a giant bacon cheeseburger, I helped myself to a piece, but after passing up the cheese and bacon, I boosted my burger's flavor profile with lettuce, tomato, buffalo sauce, and spicy mustard. With all of those flavors, I didn't even think about the bacon or cheese! At the end of the party, the chocolate peanut butter cupcakes were calling my name. I had made small changes to my diet all day, so I enjoyed a cupcake totally guilt-free! Read more: Check out my daily food and fitness blog, Carrots 'N' Cake.